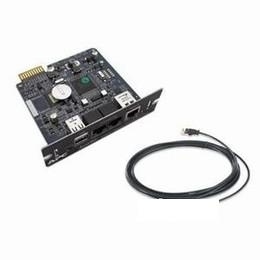 APC UPS Network Management Card allow for secure monitoring and control of an individual APC UPS via web browser, command line interface, or SNMP. Embedded technology provides exceptional reliability with notification features that inform you of problems as they occur. Management: Scheduling: Customize shut down and reboot of connected equipment and UPSs. Data logging: Identify problematic trends before they escalate or export the data log for analysis. Run command file: Run command file on shutdown sequence as well as start-up sequence. Remote UPS management: Enable management of your UPS by connecting it directly to the network. Browser Accessible: View the user interface with a browser. Provides quick access from anywhere on a secure network. Enterprise management system compatible: Manage your APC devices from a single system by forwarding SNMP traps (events) to your preferred enterprise management system. Reboot equipment remotely: Saves dispatching technicians to remote locations. Operating System Shutdown: Prevents possible data corruption by performing graceful, unattended operating system shutdown in the event of an extended power outage.